The Scottish sought to form a colony in the “New World” in order to participate in trade, which was severely restricted by the British at home. Two separate journeys and groups went to Darien, both ending in disaster. The very few who escaped the devastation and either returned home to Scotland or went elsewhere to build a life were treated as traitors. 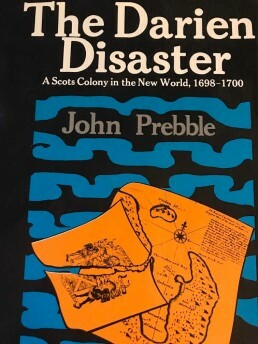 Two primary reasons for the failure of the mission were 1) the naïveté and arrogance of the Scots and 2) the far reach of the British, who forbid their subjects and allies from helping the Scots. The Darien Disaster is the story of the disastrous attempt by the Scottish to establish a colony in the Darien area of northeastern Panamá from 1698-1700. Similar to The Path Between the Seas, the story begins long before the actual event occurred with (pages and pages) of detailed descriptions of most of the individuals involved in the conception and political maneuverings surrounding this highly controversial venture. If you’re a devotee of Scottish history, and are intimately familiar with the key players in it, you’ll be pretty thrilled with this book. If you’re hoping for a detailed account of the Scots’ actual life in Darien, you’re probably going to be somewhere on the disgruntled spectrum. This book is much more about Scotland than it is about Panamá—and, to be honest, mostly about men of several cultures behaving badly. I was hoping for a more detailed account of life on the ground in Darien and a better feel for the indigenous people the Scots encountered when they were there. While there was a little bit of this, there was far from enough for someone interested in Panamanian history. All this bashing aside, despite the painful labor and challenging reading sessions, I’m actually glad I read this book. Albeit limited, it did give me some sense of what it was like in Darien during the 17th century and it reiterated an important lesson that can help make for a more positive expat experience—if one is coming to Panamá to escape the frustrations and realities of dealing with humans or governments, one is going to be seriously disappointed. This was not even possible in 1698, so it’s surely not going to be possible in the 21st century.